Even though summer activities are winding down some of the best art shows in the Chicago area are yet to come. The first three festivals listed here are at the end of August. They mark the end of summer for their communities just as Labor Day Weekend festivals signal the beginning of fall. September 16-17 is particularly a popular art festival weekend. The top one that weekend is ACE, The American Craft Exposition. Some folks may recall it used to be on Northwestern University’s Evanston campus then moved over to the Botanic Garden a couple of years ago. It is ticketed but the proceeds benefit NorthShore University HealthSystem research. 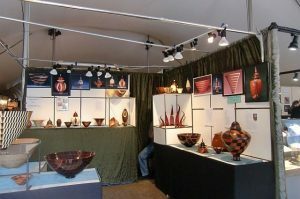 The suburb of Oak Park, just west of Chicago is holding its Oak Park Avenue-Lake Arts Crafts Show in Scoville Park at Oak Park Ave and Lake Street. Operated by the American Society of Artists, the hours are Saturday, 11 a.m. to 7 p.m. and Sunday 9 a.m. to 5 p.m. Tip: You might want to look up Frank Lloyd wright’s Oak Park designed structures before you go so you know where to look on the way to or from the art fair. For more information visit the American Society of Artists. The annual Port Clinton Art Festival features about 265 artists from several countries and states downtown Highland Park. Spread across the Port Clinton shopping square, Central Avenue, it also now crosses Central at 1st and 2nd Streets. Hours are 10 a.m. to 6 p.m. For other information visit Amdur Productions. Artist Mark McMahon who usually sells from his studio and on commission, can be found at a corner of Lake Forest’s annual Art on the Square. Art Fair on the Square, sponsored by the Deer Path Art League, fills historic Market Square and Western Avenue across from the METRA station downtown Lake Forest from 10 a.m. to 5 p.m. It features 180 exhibitors. For more info: visit Deerpath Art League. At the same time, visit the Lake Forest-Lake Bluff Artisan Guild Fall Fair adjacent to Market Square in the parking lots of Lake Forest Bank & Trust to see 45 more booths. There is live music, a BBQ cookout and homemade ice cream. This fair benefits C.R.O.Y.A, the local youth group. Lakeview East’s Festival of the Arts showcases 150 exhibitors at Broadway Street and Belmont Avenue, Sat. 10 a.m. to 7 p.m. and Sun. 10 a.m. to 6 p.m. For more information visit Lakeview Festival. The annual Renegade Craft Fair featuring 300 crafters takes place at Division Street between Damen Avenue and Paulina Street from 10 a.m. to 7 p.m. Visit Renegade Crafts. The American Craft Exposition showcases high quality works at its annual fair at the Chicago Botanic Garden. The American Craft Exposition returns to the Chicago Botanic Garden, 1000 E. Lake Cook Rd. (east of Edens Expressway. The Preview Party is Sept. 14: 6:30 to 9 p.m. General admission is Fri. and Sat. 10 a.m. to 6 p.m. and Sun. 11 a.m. to 5 p.m. Parking is extra if not a Garden member. For ticket prices and other information call (847) 835-5440 and visit ACE. 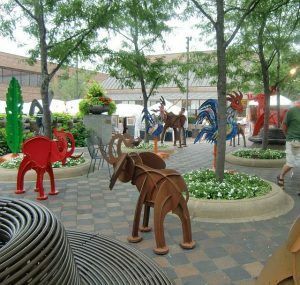 The Park Forest Art Fair, considered among the oldest juried fairs in the area will feature more than 90 exhibitors downtown on the Village Square at at Main & Cunningham Streets. Presented by the tall Grass Arts Association, the fair is from 10 a.m. to 5 p.m. For more information visit tallgrassarts. The West Loop Art Fest has 180 exhibitors on Washington Boulevard from Halsted to Racine. The fair is 11 a.m. to 7 p.m.. For more information visit Amdur Productions. The annual Ravenswood ArtWalk is along Ravenswood Avenue from Irving Park Road to Leland Avenue from 11 a.m. to 6 p.m. Co-presented by the Greater Ravenswood Chamber and Community Council and the sponsor, Access contemporary Music, ArtWalk combines its arts and creative industries.m See Ravenswood ArtWalk. Eagle Street and Jackson Avenue along the DuPage River. Hours are 10 a.m. to 5 p.m. See more information at Naperville Riverwalk. A tiny suburb known mostly for its restaurants, Highwood started its Annual Starving Artists Show last year and drew a crowd. Its 2nd annual show will showcase 120 artists along Sheridan from Highwood to Webster Avenues from 10 a.m. to 5 p.m.. For more information visit Amdur Productions. Art in the Barn features 166 exhibitors on the grounds of the Good Shepherd Hospital, 450 W Highway 22. Hours are 10 a.m. to 5 p.m. For more information visit Art in the Barn. 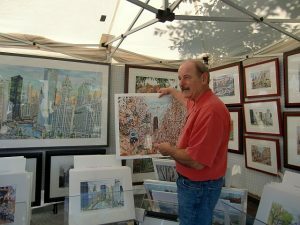 The Edgewater Arts Festival, formerly Edgewater fall Art Fair, is a popular neighborhood get together that now attracts visitors from other Chicago communities. Spread from 1040 to 1190 West Granville Ave. it features the performing and visual arts. Along with more than 100 juried-in Chicago area artists, the festival has three music stages, a beer garden and a children’s activity area. Hours are 11 a.m. to 6 p.m. For more information visit Edgewater Arts. Starting to pull together artwork for the Labor day show in Lake Forest. I have done this show since I was ten years old.